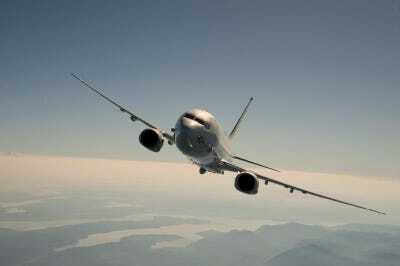 NAVAIR US NavyA US Navy P-8A Poseidon reconnaissance plane. The US Navy aircraft stayed the course, insisting that it was within its legal rights. The incident followed a report from the Philippine government revealing that China had been sending out threatening radio queries to foreign ships and planes at an increased frequency. Chinese forces deployed to the hotly contested South China Sea ordered a US Navy reconnaissance aircraft to “leave immediately” six times Friday, but the pilot stayed the course, refusing to back down. A US Navy P-8A Poseidon reconnaissance plane flew past China’s garrisons in the Spratly Islands, giving CNN reporters aboard the aircraft a view of Chinese militarization in the region. Flying over Chinese strongholds on Mischief Reef, Johnson Reef, Fiery Cross Reef, and Subi Reef, CNN spotted “large radar installations, power plants, and runways sturdy enough to carry large military aircraft.” At one outpost, onboard sensors detected 86 vessels, including Chinese Coast Guard ships, which China has been known to use to strong-arm countries with competing claims in the South China Sea. The Chinese stationed in the area were not exactly kind hosts to the uninvited guests. Six warnings were issued, according to CNN, and the US Navy responded the same every time. Friday’s incident comes on the heels of a report by the Philippine government revealing that China has been increasingly threatening foreign ships and planes operating in the South China Sea. “Leave immediately,” Chinese forces in the Spratlys warned a Philippine military aircraft earlier this year,according to the Associated Press. “I am warning you again, leave immediately or you will pay the possible consequences,” the voice said over the radio. The US Navy has noticed an increase in such queries as well. Of greater concern for the US military are recent Chinese deployments of military equipment and weapons systems, such as jamming technology, anti-ship cruise missiles, and surface-to-air missiles. While the US has accused China of “intimidation and coercion” in the disputed waterway, Beijing argues it is the US, not China, that is causing trouble in the region. The Chinese Ministry of Foreign Affairs has yet to comment on Friday’s exchange between the Chinese military and the US Navy.